What’s the formula for perfect crafting success? Just add imagination! With the Brother ScanNCut DX. Now, the only home and hobby cutting machine with a built-in scanner, has essentially everything else you need to create stunning home crafting projects. Like Brother’s revolutionary Auto-Blade sensor technology. This wonderful, time-saving feature automatically detects material thickness to cut precise custom and built-in patterns. It even has a setting for making half cuts so you can cut the top layer of vinyl without cutting the backing. You’ll be able to create and edit designs quickly and easily on the 5-inch LCD touch screen display. You’ll love that you can weld, rotate and resize your designs right on the screen–there’s no need to use a computer or complicated software. And ScanNCut DX has over 1300 built-in designs. Including 140 quilt patterns and 17 lettering fonts. And that doesn’t even include the many custom designs you can make by combining built-in designs with scanned images. Exclusive to this model, ScanNCut DX reads most PES and PHC files directly. There’s no need to convert. Just select the appliqué parts you want to cut. Then, take those cut pieces over to your Brother embroidery machine and tack them down to create unique fabric items. Mat-less cutting is now a reality with the optional roll feeder for vinyl. It’s perfect for those bigger projects like car decals and signs. Cut material up to 12 inches wide and almost 6 feet in length. And wait…there’s more, it’s whisper quiet. Just right for those late-night crafting sessions. What more do you need to achieve crafting brilliance? Just one thing…imagination! The Brother ScanNCut DX. Large Scanning and Cutting Area Using the included 12″ x 12″ cutting mat, or the 12″ x 24″ cutting mat (available for additional purchase), easily create and cut a wide variety of designs – from one as small as a delicate snowflake for a holiday ornament or one as large as an inspirational wall quote to place in your family living room. Plus, the cutting mats double as a scanning mat for ease of use! Now with 12″ x 24″ scanning capability! 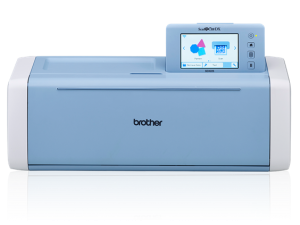 (SDX225 model only) Great for scanning 18″ doll patterns and large quilt patterns to create cut data.